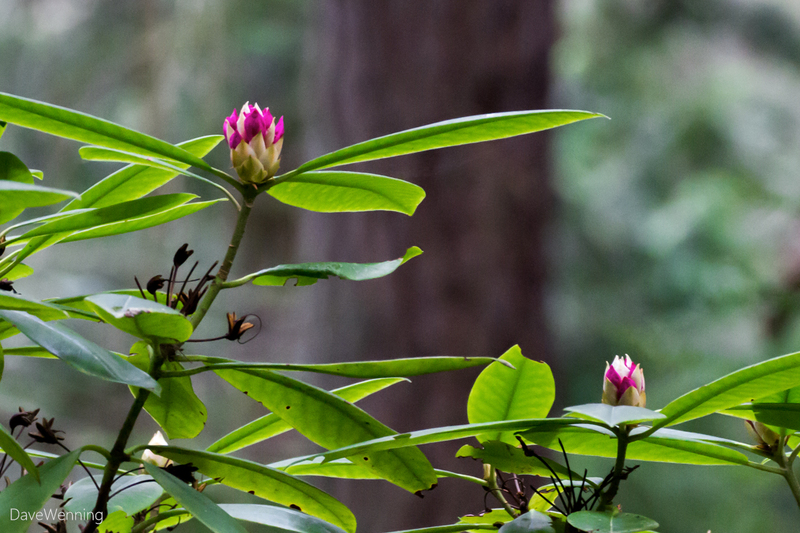 Yesterday's visit to the rhododendron grove in Deception Pass State Park revealed that the blossoms are finally starting to open. With some warmer weather, the blooming should go quickly now. Again, rain had been predicted, but it did not materialize. There was a heavy, dark overcast which created very poor lighting for photos in the forest understory. It was almost like night in some spots. Nevertheless, I did manage to get a few shots of the opening buds. Based on what I am seeing, this year's bloom may not be as spectacular as it was last year. I could be wrong about this. The flower buds can be difficult to spot at a distance from the trail. Rhody flower buds are set during late summer for next year's bloom. The conditions at this time can determine the quality and quantity of next year's flowers. I have also read that if there is a heavy bloom one year, some plants might take a year off. 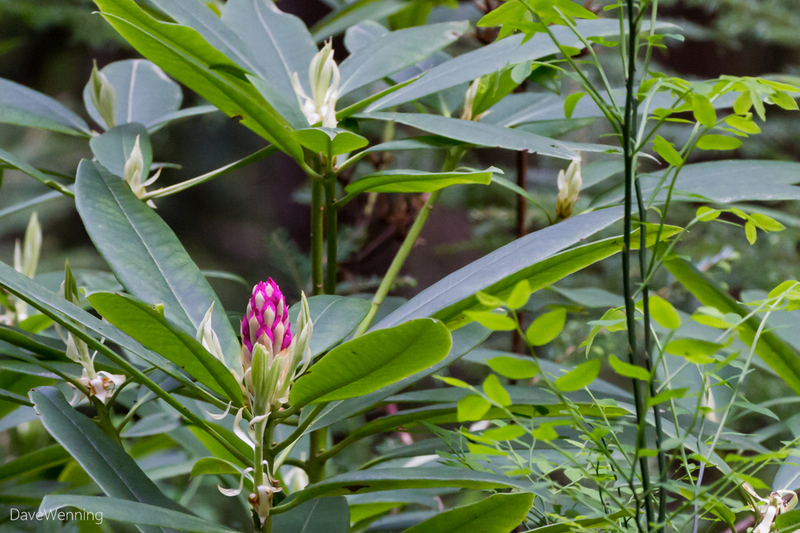 As we have seen in previous posts, you can find more than rhododendrons in these woods. 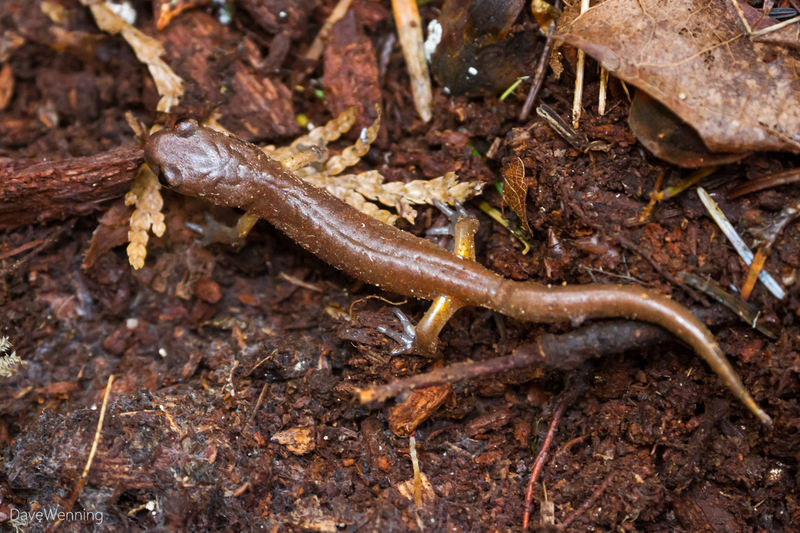 On this visit, I found an Ensatina Salamander (Ensatina eschscholtzii). This is the second one I have seen this season. They are humble and reclusive yet fascinating little creatures. This species has no lungs or gills, breathes by exchanging oxygen through its skin, and does not need water to breed. You can identify them by the pinch at the base of the tail. They should not be handled. The oils and chemicals on your hands can disrupt the oxygen exchange through their skin. They are most active during fall, winter and spring when it is cool and damp. They even sometimes breed in the winter. You can read more about Ensatina at Wild Fidalgo. 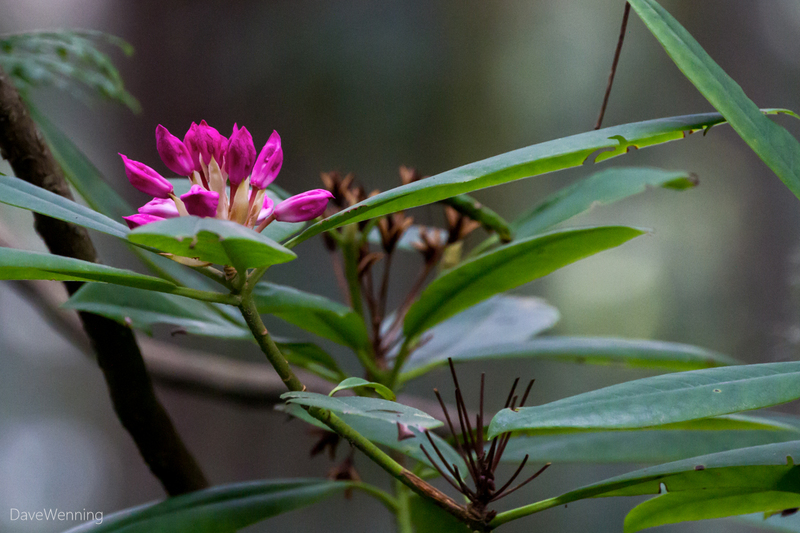 Because it was so dark, I didn't spend a lot of time in the rhododendron forest. I took the easy shortcut back to the parking lot via the Discovery Trail. I still had some hiking yen left in me, so I decided to check out the West Beach Sand Dunes. Since it is all open to the sky, the light was much better, but it was very windy. 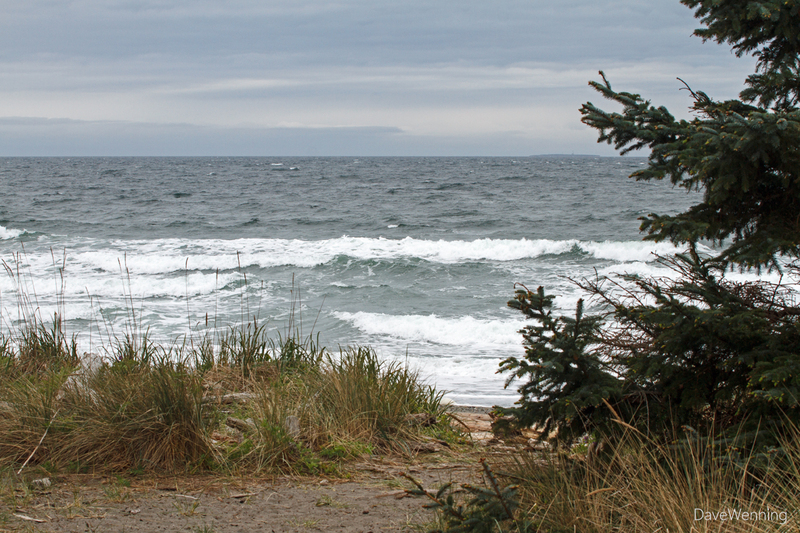 There was surf rolling in off the Strait of Juan de Fuca. 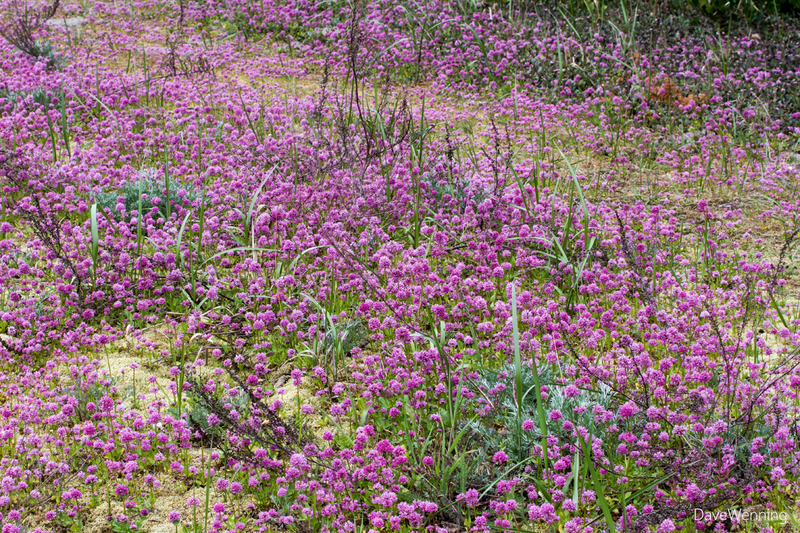 Every spring, the Sea Blush (Plectritis congesta) paints the sand dunes pink. I had forgotten all about this. It's a spectacular display, especially in this place that is seemingly hostile to wildflowers. This flower is an annual sprouting from seed every year. This is like a miracle with the winds and shifting sands. These fragile plants are the only things protecting the dunes. This is one of the reasons visitors are asked to stay on the paved pathways. 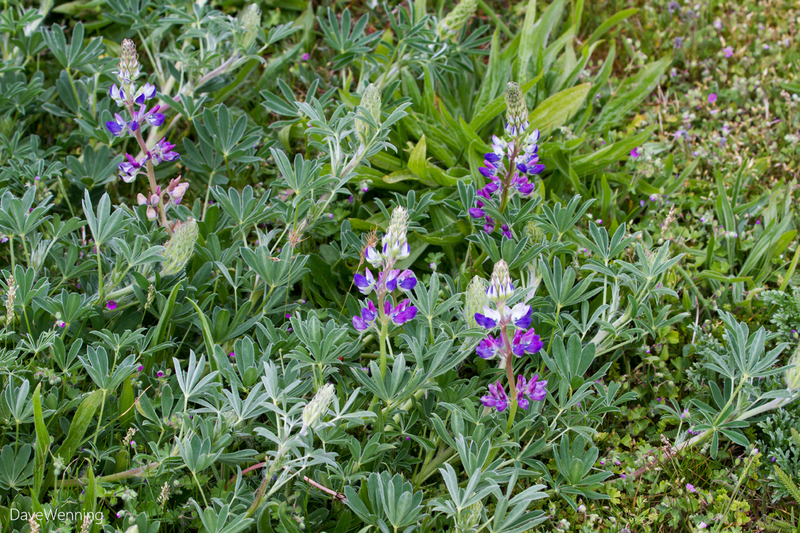 The Seashore Lupine (Lupinus littoralis) is also blooming now. Like Sea Blush, it crouches low to the ground as a defense against the winds. Nevertheless, these flowers were put in constant motion by the breezes making them very difficult to photograph. 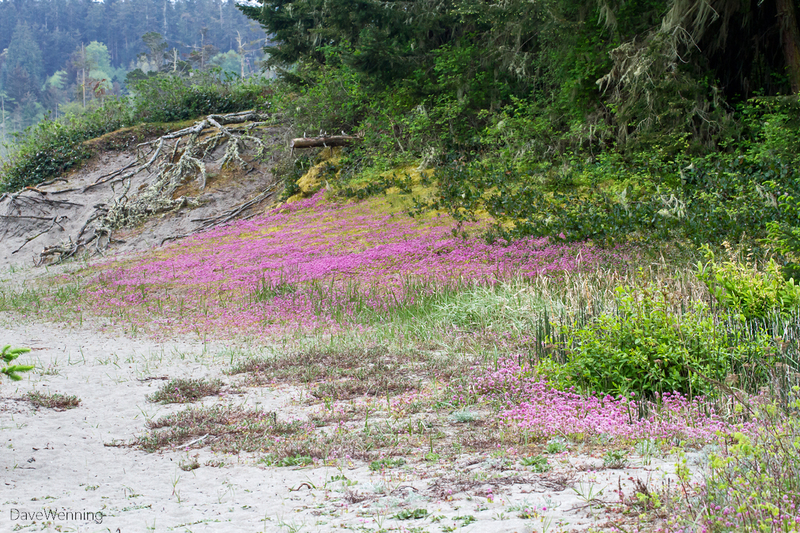 Left: I have not been able to identify these tiny pink flowers growing all over the north end of the dunes. Click or right-click the photo to view it full size. The closest possibility I have found is Redstem Filaree or Stork's Bill, but I can't be positive. If anyone knows what this is, please post a comment below. UPDATE: I received word from Washington State Parks regarding this plant's ID. 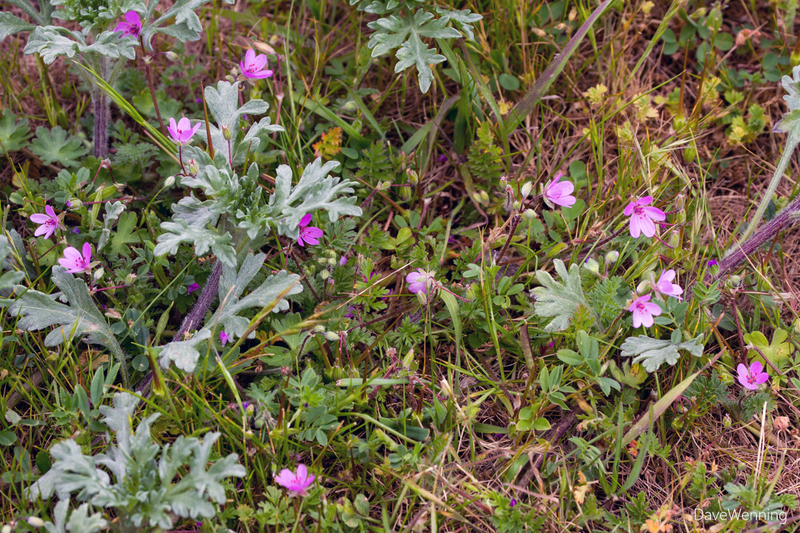 They also believe it is Redstem Filaree or Stork's Bill (Erodium circutarium). This is an introduced weed native to Europe now widespread in western North America. 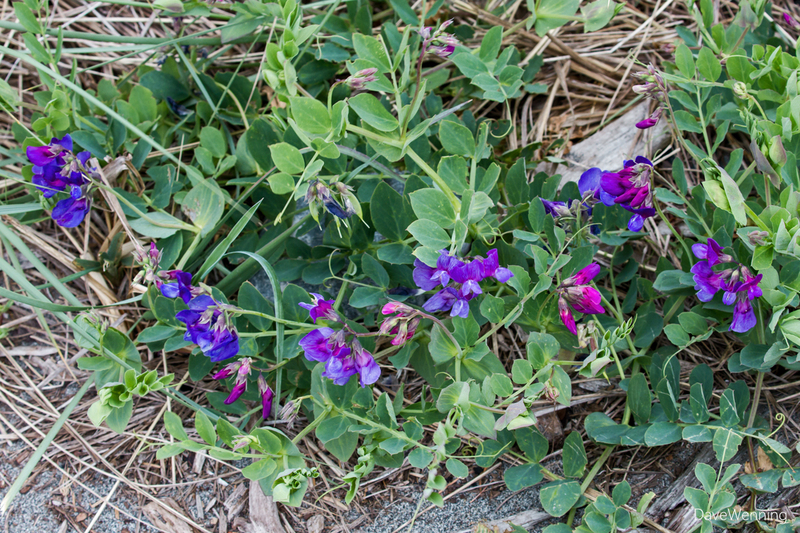 Right: When you are at the beach around here, look for Beach Pea (Lathyrus japonicus). Find it around the driftwood at the top of the tidal zone. 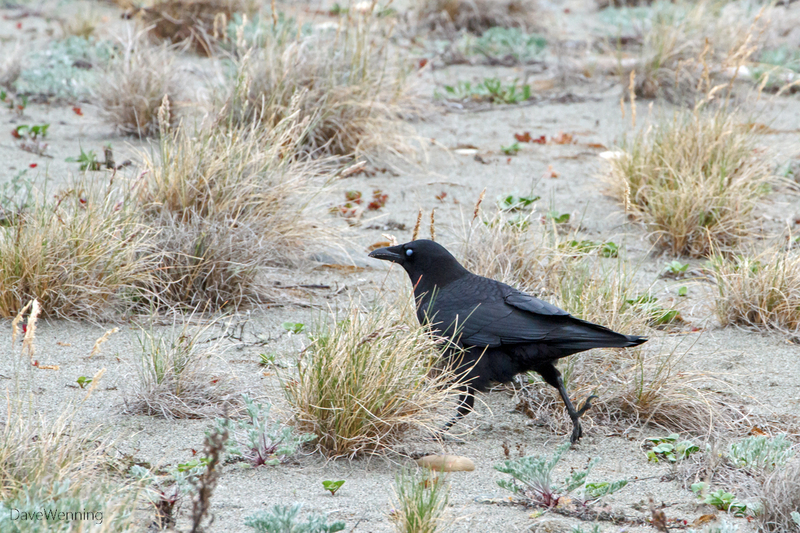 I spotted this Northwestern Crow (Corvus caurinus) patrolling the dunes. It was by itself which is unusual. I usually see them here in gangs which are called "murders" or "musters." Is that a cataract on the left eye or just the way the light was hitting it? Some consider these a subspecies of the American Crow (C. brachyrhynchos), but I like the idea of our own regional variety. They are always found around the beach. On the way out from West Beach, I stopped at the East Cranberry Lake trailhead. This is always a good spot for wildlife. 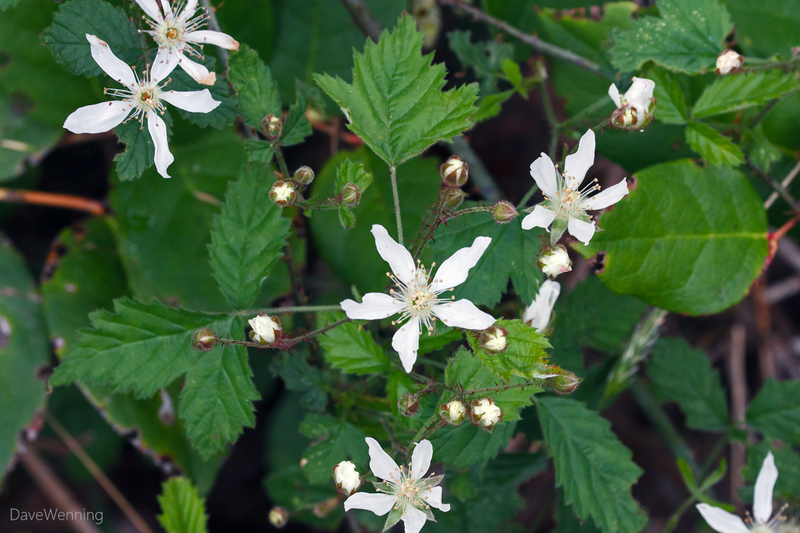 I found the entire trail lined with our native Trailing Blackberry (Rubus ursinus) now in full bloom. I am not sure if berry picking is allowed in state parks. If it is, this would be a great spot. When I find out, I will update this post. East Cranberry Lake is beaver country. You can see evidence of their work all along the shoreline. There is a marshy island just offshore from the trail. I keep wondering if it was built by the beavers. 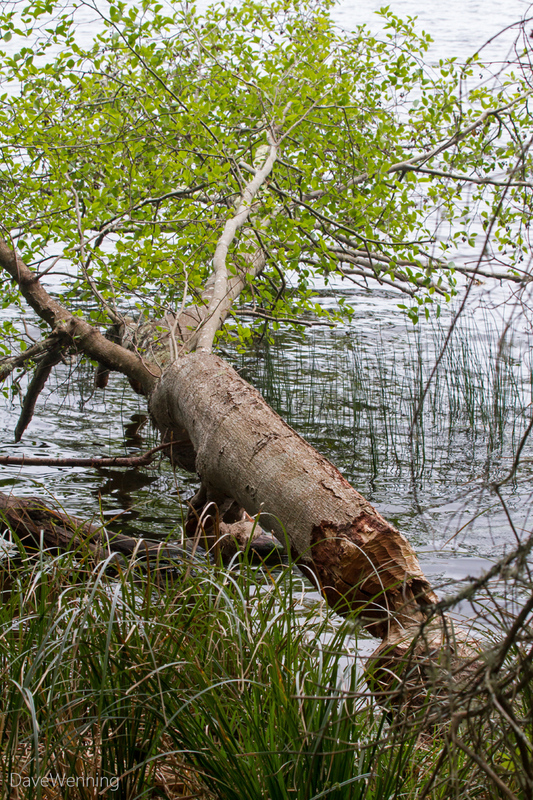 It is well known that beavers can alter landscapes in major ways. The island includes a stand of medium height conifers. I believe these are Sitka Spruce because of the marshy conditions. 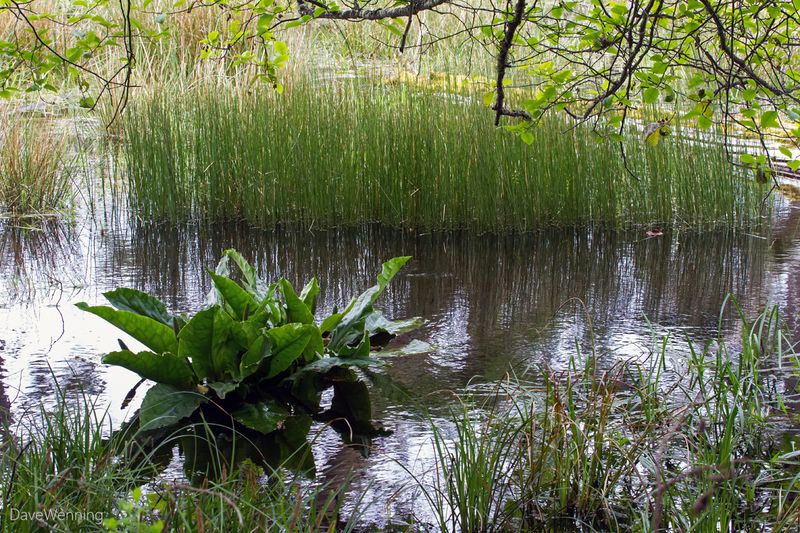 Between the trail and the island is a wonderful, marshy waterway. 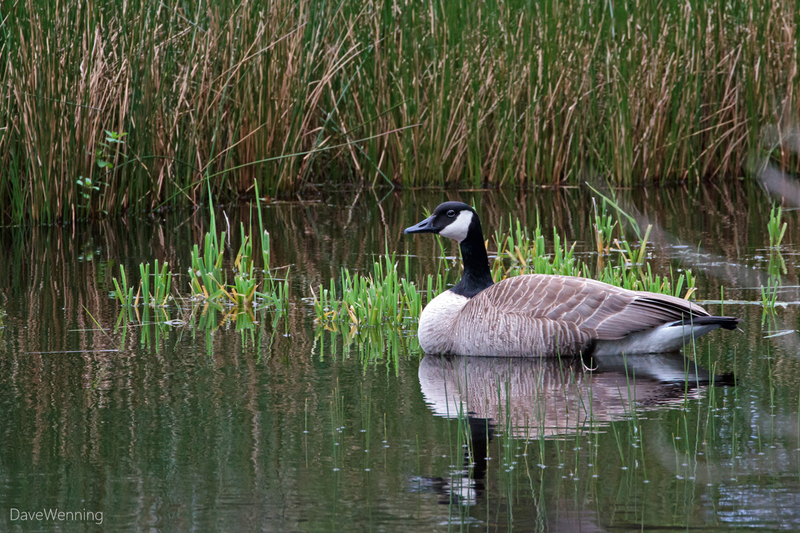 Hiking southbound, I spotted this Canada Goose (Branta canadensis) floating motionless in the water. I found this odd. Usually, they get noisy and fly off when people get too close. This one just sat there quietly, barely moving a muscle. Although it looked healthy, I wondered if it was ill. I put on my best wildlife demeanor, remaining quiet and avoiding threatening postures and movements. On my return trip back up the trail, I had a different view of the island. From this angle, I discovered what was holding the first bird captivated. He was standing guard for his mate who was sitting on her nest at the edge of the island. By now the first bird had moved out into the lake, so apparently, he decided I was OK. This was a great discovery, but I'm probably lucky I wasn't attacked. 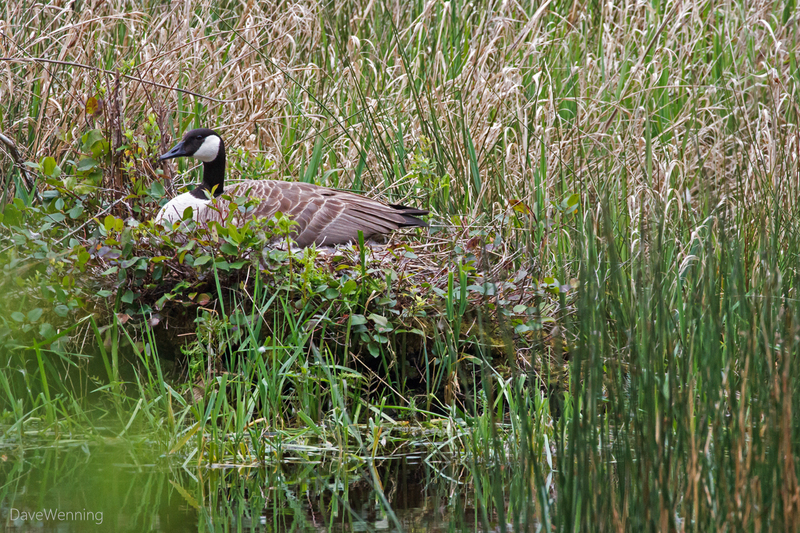 I added a post about these geese with additional photos over at Wild Fidalgo. This wildlife encounter capped off a perfect morning exploring some of the trails in Deception Pass State Park. 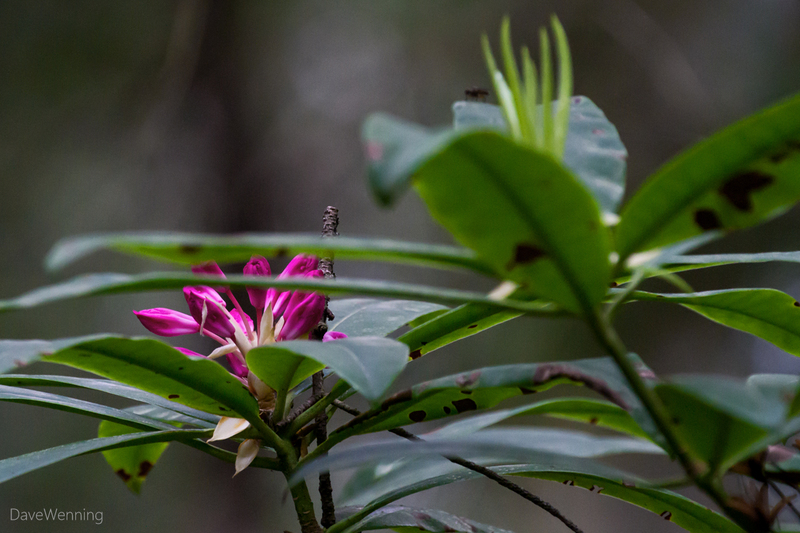 As I said, there is a lot more than rhododendrons to be discovered there.